I knew enough about the low-paying young adult nonfiction book racket to know that sometimes hard-working editors that had received unusable manuscripts from contracted authors had to hurriedly ghostwrite entire books without getting any authorial credit. Maybe my name had gotten pencilled in and the editor I knew or some other editor had scrambled to hit the deadline by throwing the book together and then, while racing with the manuscript to the local FedEx, had slightly altered the pencilled-in author name by adding an “ua” to the first name, a couple middle initials, and an extra “l” in the last name. 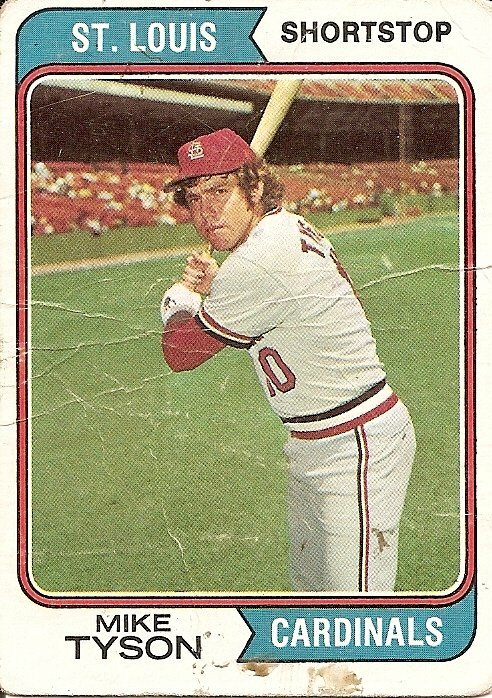 In other words, it seems likely, given the overwhelming popularity of a certain 1976 Sylvester Stallone film, that—long before the other Mike Tyson—the chipmunk-cheeked Mike Tyson shown here was ribbed by his Cardinals teammates for sharing a name with a boxer. Or maybe not. Who knows? All I can really say for sure about any of this is that if there actually is someone out there named Joshua D.G. Willker, I hope I never meet him. He sounds like a douche. 1. I’d bet there’s an equal chance that Joshua DG Willker is a misunderstood dreamer, whishing he were the next Alfred Slote. 2. Hmm, did this card spend a few weeks in some bicycle spokes or something? 3. 1 : Hm, maybe you’re right about that. Anybody who aspires to Slote-hood is OK with me. 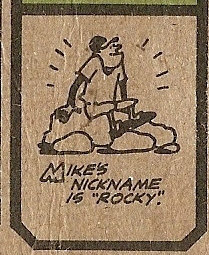 2 : I never did the bicycle spokes thing with baseball cards, so I’m not sure how my 1974 Mike Tyson got so thoroughly Buster-Douglassed. The real mystery to me is the nature of the reddish goo along the bottom border of the card and on Rocky Tyson’s thigh. 5. A quick Googling shows “Joshua D.G. Wilker” co-wrote “Everything You Need to Know About Sports Gambling” with “Joshua D.G. Willker.” The aforementioned Mr. D.G. Wilker wrote several other YA novels. 6. 5 : Yeah, in cyberspace the “D.G.” has somehow insinuated itself over the years into many places where it did not originally exist. 7. I am reminded of two things. Identity can be a tenuous thing, I guess. 8. The central character in Paul Auster’s ‘City of Glass’ is a reclusive author called Daniel Quinn, a writer of detective fiction, who hides behind the pseudonym of William Wilson. William Wilson is also the name of an Edgar Allan Poe short story about doppelgängers. During the 1980s there were two fleet centerfielders named Wilson; Mookie and Willie. The given name of both of them is William. You need to find Mookie Wilker, Josh. 9. 9 Baseball is replete with Alex Gonzalezes and Luis Gonzalezes. There is only one Alex Rodriguez. I do remember that Philip Roth’s ‘Operation Shylock’ revolved around an impostor Philip Roth. 10. Doesn’t Paul Auster get a phone call from Paul Auster in City of Glass? Maybe this DG fellow will call up Josh? 11. Looked it up. Quinn gets a call intended for Paul Auster, the detective. Still, I’d watch out for this DG fellow and his penchant for gambling. 12. I have a fairly common family name to pair up with “Dave”, so I have met a couple of my Doppelgängers. One guy was majoring in the same subject at the same school at the same time, though a little behind me. We did have a friend in common; how weird for that guy. I had to phone a Doppelgänger in my large company once. That was strange. “Hello, is this David X”? 13. My sports figure DG has a penchant for gambling… and golf. 14. Jazz immortal/multi-instrumentalist Yusef Lateef’s original name was “Bill Evans,” though luckily he sagely avoided piano and converted to Islam. Though it’s not “Zernial”, I do have an uncommon name. I live in Chicago and there’s a man with the same name living in a nearby suburb. I’ve received mail for him, sent by an estranged family member trying to reestablish contact. He has received mail intended for me, sympathy cards following the death of my father. In both instances, we opened the items by mistake but returned the them to the sender. I’ve never met or contacted this other me. We share nothing in common but a name but, by virtue of that name being rare, we’ve inadvertantly learned intimate details of each others lives. Unlike some of the other doppelganger scenarios mentioned above, I don’t fear, resent, or have any antipathy towards him. Still, there’s an odd sense of displacement and I can’t help but wonder if he feels the same way.